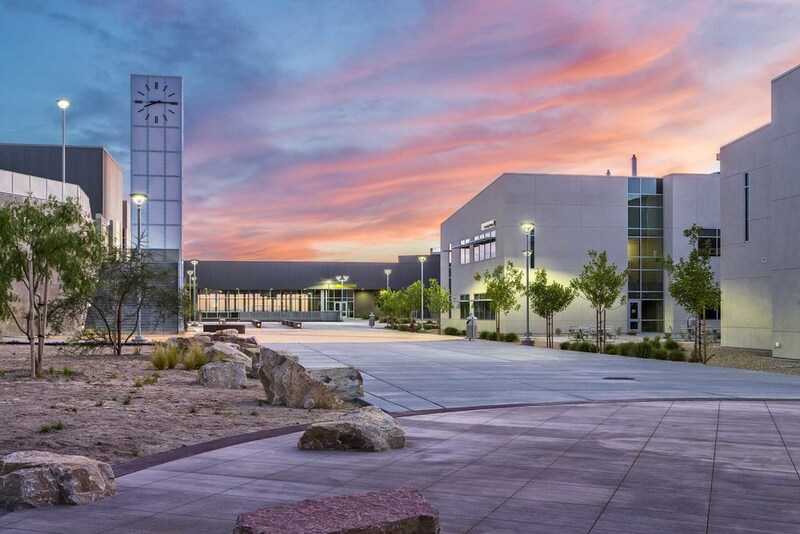 Designed by Dekker Perich Sabatini (DPS) in association with local Las Cruces ASA Architects, this 328,500sf, 160-acre high school campus is a welcoming, state-of-the-art learning environment that celebrates the natural landscape. The campus plan supports a small learning community approach which was implemented in an effort to reduce student dropout rates. Separate buildings and outdoor spaces facilitate the implementation of new teaching and learning approaches and the small learning communities become the home base of both students and instructors. A separate 9th grade academy is designed for freshman, in an effort to ease the transition to high school. The campus plan nestles buildings and outdoor spaces within the natural topography. The campus layout of separate buildings organized around a series of outdoor plazas and courtyards takes advantage of the Las Cruces climate and provides opportunities for outdoor learning and minimizes expensive conditioned space dedicated to indoor circulation. 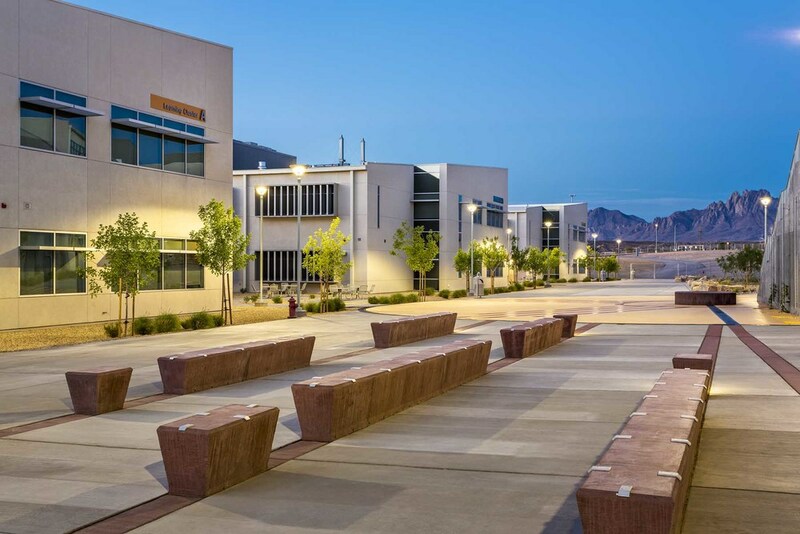 By working with the topography, the campus design maximizes views of the nearby Organ Mountains and provides gathering areas protected from the sun and wind. 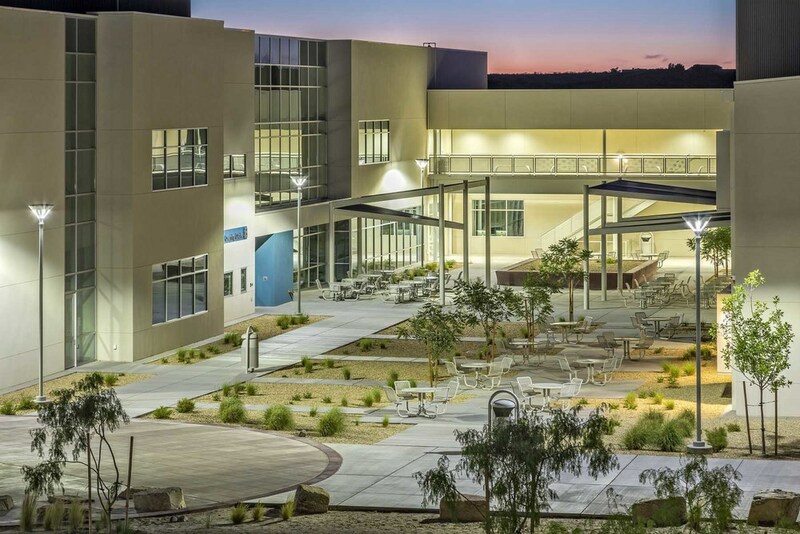 The campus composition connects students, faculty and staff to nature by framing views to the Organ Mountains from the primary plaza and using native plants in the built landscape. The campus plan and building designs takes advantage of significant changes in topography across the site to provide more views to the surrounding landscape and to subdivide the large property into distinctly different, human-scale spaces. The campus plan includes a graded area reserved for a future NMSU experimental turf farm that presents a new learning opportunity on campus. Vernacular rock plating with intermittent ocotillo plantings is used for slope stabilization in several high visibility areas. A wide, shaded breezeway between the academic plazas and the recreation fields is comprised of stairs and an undulating, rolling artificial turf slope designed for hanging out. The security design for the large campus was iterative- including changes in the campus site plan, building design, lighting design, video/camera placement, and interior and exterior fencing and gates. The security design accommodates after-hours use of recreation, arts and resource facilities. A significant outdoor recreation program is integrated into the campus plan. 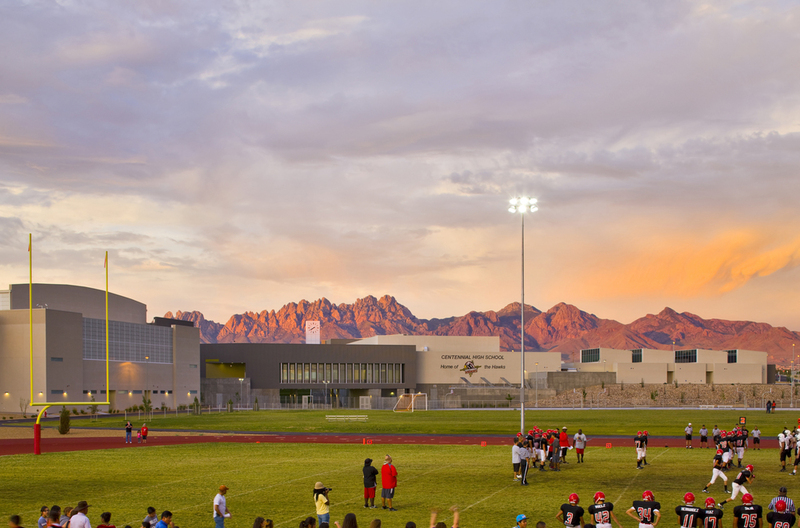 The campus plan includes a lighted track and football stadium for junior varsity football games, one soccer field, two practice fields, softball and baseball fields, tennis courts and basketball courts. 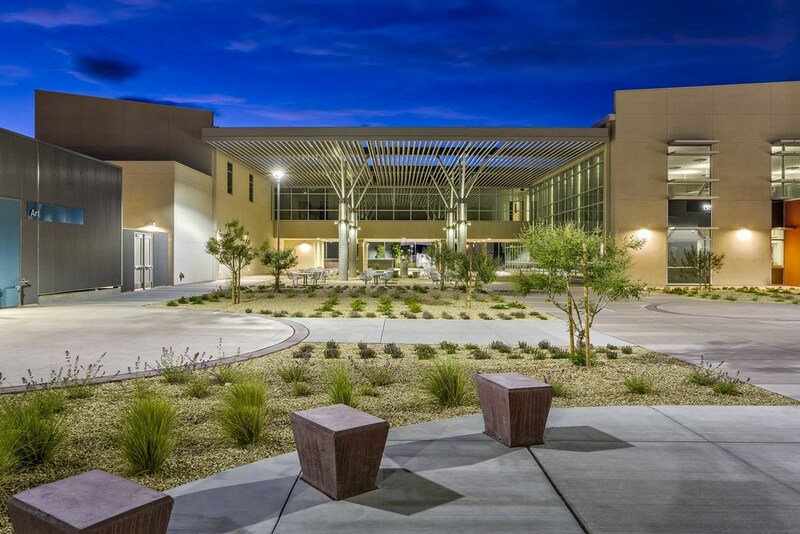 Supporting buildings include a concession/restroom structure, maintenance building and storage facilities, and multi-purpose paved outdoor spaces that were right-sized for marching band practice as well as parking. Sports facilities are oriented and graded precisely for optimum active sports competition. Athletic and performing arts spaces are located together to allow for large community events and competitions. Sustainable site planning and design elements include an unusual energy efficient ice storage mechanical system that allows the District to save money through off-peak energy usage. This and other features such as extensive daylighting with translucent panels, solar hot water systems, efficient lighting systems and sensors, and landscape water harvesting promote sustainability throughout the campus. Other Design and Consulting Firms: ASA Architects, Bridgers & Paxton Consulting Engineers Inc., Bohannan Huston Inc., Coates Irrigation Consultants Inc.